Dundurn A-27 Recces, Navy (HMCS Unicorn), No. 4 Service Flying Training, No. 12 V. T. S.
It was a story book finish in the Southern League as the Regina Caps, a ragtag lineup thrown togther in mid-season as a replacement for a departing team, charged ahead to win the championship downing Notre Dame Hounds in the playoff final. 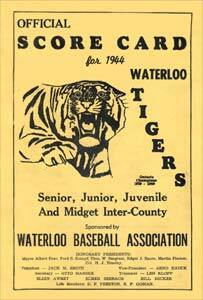 With a number of military bases stationed in Saskatoon and district during 1944, the Inter-Active Service Baseball League flourished. The four-team circuit had rosters stocked full of high calibre players, primarily from the prairies, and played their games at Cairns Field. Among the stars were Lloyd Bradley, Gayle Shupe, Ace Corbin and Pete Prediger. Further north, the Prince Albert League continue its run of success with thre military teams in the five-team circuit. Again, the Bohemians would emerge as the champions. 20-year-old hurler Bobby Shore was a difference-maker for the Bohs. Dundurn Camp Recces capture the title at the Saskatoon Exhibition Tournament. The 39th annual Midnight Sun Baseball Classic in Fairbanks, Alaska, had a Canadian flavour. In one of the closest duels in the history of the event, played on the longest day of the year, the Edmonton Yanks upset the Ladd Field team of Fairbanks 4-3 in ten innings before a crowd of 2,000. The game started in daylight, shortly after midnight, and the sun was shining brightly when the game ended 2 1/2 hours later. The initial contest was played in 1906 and has been played annually since. Down by a run going into the 9th inning, Edmonton scored three runs on two walks, a double by third sacker Columbus Birchfield and a triple by outfielder Manuel Dorsky. But, Ladd Field came right back in the bottom of the 9th as Lon Battles drove in two runs with a double. Edmonton's Birchfield came through in the extra frame with a scorching single to right to scored catcher Al Goodrich with the winning marker. Goodrich had drawn a walk and advanced to second on pitcher Johnny Gray's single. Gray allowed eight hits in registering the win. Neil Webster, who relieved Bob Brooks in the 10th took the loss.